A wayward lobsterman from Long Island was recently plucked from the water after more than 12 hours by using his rubber boots to stay afloat. He was eventually found more than 40 miles from his boat (44ft Anna Mary). He was dragging a cooler to the stern of the boat at 3:30am when the handle snapped. Most lobster boats have open sterns and he plunged right off the back of the boat into 4-6ft seas. The rest of the crew was sleeping and did not notice he was missing for 3 hours. The Coast Guard found him 9 hours later. 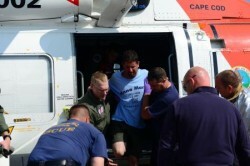 He was flown to Falmouth, MA and treated for dehydration, exposure and hypothermia. He is going to be just fine and back to work in a few days (because he’s a fisherman!). Not suprisingly, John Aldridge, a veteran fisherman for nearly 20 years, was not wearing a life jacket when he fell in. He emptied the water from his boots and then put one under each arm for flotation and warmth. They basically saved his life. Fishing boots are an impartant part of every angler’s gear especially in the Northeast. Rubber boots are the most common and are available in various heights and with/without insulation. The differences in price are typically tied to the overall quality of the boot, the insulation (lining), and insoles. Insoles are important as most anglers spend countless hours standing. Some anglers buy less expensive boots and simply replace the insoles.